The Boy Azooga story encompasses both Charlotte Church’s Late Night Pop Dungeon and playing triangle for the National Youth Orchestra Of Wales. But this only brings us to the margins of a musical map that also includes The Beach Boys, Nigerian funk, krautrock and 1940s British noir fiction. Boy Azooga’s debut album, 1, 2 Kung Fu, is piloted by Davey Newington, a young man with much musical heritage. One of his granddads was a jazzer who played drums for the Royal Marines. Davey’s dad (violin) and his mum (clarinet) both played, and met, in the BBC National Orchestra Of Wales. Davey himself also enjoyed orchestral engagement, playing triangle for the National Youth Orchestra Of Wales. Davey took up the drums at the age of six. More recently, and operating as one Bongo Fury, he became the rhythmic pulse for Late Night Pop Dungeon, sat behind the kit as Charlotte plied joyous pop hedonism to Glastonbury and beyond. This would have been enough for some, but now Davey returns as Boy Azooga. The oldest song on the debut album is Hangover Square, titled after Patrick Hamilton’s celebrated and blackly compelling 1941 novel of the same name. The book was given to Davey by his dad as Davey left home at the age of 18. He was so taken with the novel that he almost immediately turned the book’s narrative into a song. Now, completing a circle, Newington senior plays strings on the Boy Azooga album. Davey plays everything else. By way of illustration of Davey’s multifarious musical mission, the track Face Behind Her Cigarette both hints at Hot Butter’s 1972 synth-pop smash Popcorn and draws inspiration from the late Nigerian funk overlord William Onyeabor. The filmic instrumental Breakfast Epiphany II is a response to The Beach Boys’ Don’t Talk (Put Your Head On My Shoulder), as featured in an LSD-fuelled scene in the Brian Wilson biopic Love & Mercy. Boy Azooga close 1, 2 Kung Fu with Sitting On The First Rock From The Sun, a piece of poised 1960s- flavoured classicism that expands into a funky prog-kraut wig-out. Other influences on the album include Sly & The Family Stone, Caribou, Black Sabbath, Outkast, Van McCoy, Ty Segall and The Beastie Boys. It’s a range of listening that reflects how Davey moved on from a school-days love of Nirvana and Run-DMC – which was partly down to an inspirational art teacher. Davey is evangelical about his musical influences. His choice of band name also has links with cultural precedent – this time the 1994 film The Little Rascals, which was, in turn, based on Our Gang, the series of comedy shorts created by Laurel & Hardy producer Hal Roach. “When we were growing up,” says Davey, “we used the watch the film The Little Rascals at my gran’s house. In that film they chant ‘Azooga-zooga-zooga’ so the name comes from that. My cousin is in a really good Edinburgh-based band called Man Of Moon. When me and him text each other we always sign off with ‘Azooga-zooga.’ I’d wanted to call the band Bo Azooga after Bo Diddley, but my girlfriend told me BO was not something good to have in a name…” Alongside the triangle, Davey also played timpani, xylophone and sleighbells for various youth orchestras. He was delighted to find that The Stooges also deployed sleighbells, on tracks such as I Wanna Be Your Dog. Now sleighbells feature on the Boy Azooga album. But Davey’s treasure chest of hand-held percussion doesn’t stop there. 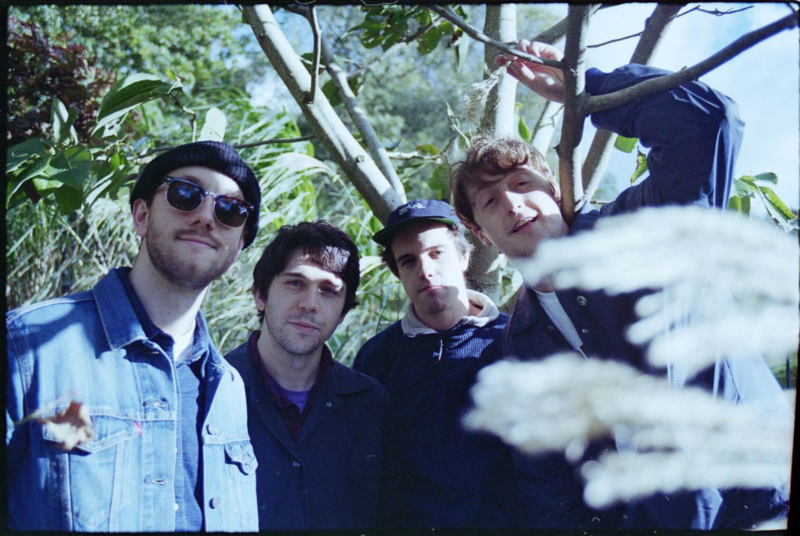 Maracas are a key feature with Face Behind Her Cigarette, the song with which Boy Azooga often finish their live set, and which turns into a rave/psych monster-mash in the process.